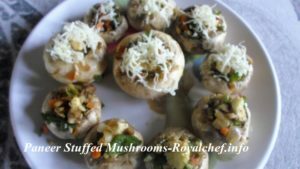 This is a Recipe for making at home tasty, delicious and nutritious Paneer Stuffed Mushroom. 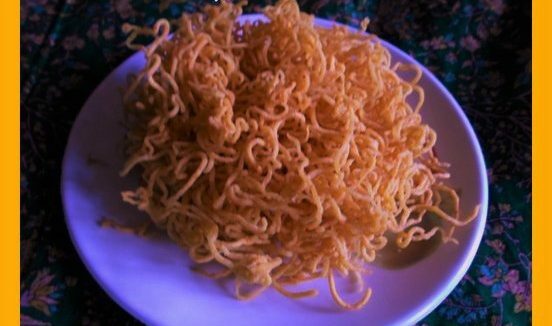 This dish makes a great starters snack, which can be also be served along with the main course. I have also used french beans, carrots and capsicum along with mushrooms and paneer for making this recipe. Wash and clean the Mushrooms, remove the steams, chop and keep them aside. Chop the French Beans, Carrot, Capsicum, Onion, Garlic and Green Chilies. In a Kadai add a tablespoon of Butter and add the chopped Onion, Garlic, Green Chilies and saute for a minute, then add the chopped Beans, Carrot, Capsicum and saute for 2-3 minutes on a slow flame. Add the chopped Mushroom, Paneer, Garam Masala, Salt and saute for 2 minutes on a slow flame. Remove from the flame and keep it aside for cooling. Take one Mushroom and fill the mixture into the Mushroom and keep it aside. Prepare all the Mushroom using the same procedure. Heat the non stick pan and arrange the Mushrooms and garnish them with shredded Cheese and Chat Masala. Add some butter around the Mushrooms and cook then on a slow flame for 5 minutes, or you can use Aape Patra also. Serve Paneer stuffed Mushroom with Tomato Sauce or Mint Chutney.